Coniferous forest plants (plants that grow in coniferous forests) are a unique and beautiful part of our world's biodiversity. 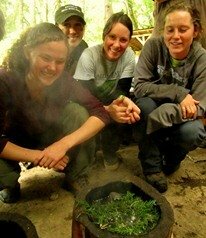 They provide food, medicine, wildlife habitat, and materials for tools, clothing, shelter, and more. There are many different kinds of forest plants that make up the complex layers of life in the Pacific Northwest. Described below are some of the most common, interesting, and useful plants that grow in coniferous forests. General: The Saskatoon is a shrubby forest plant. It is also called western serviceberry. Flowers: It is known for producing clusters of beautiful 5-petaled white flowers in the spring. Fruits: In the summer, it has spherical edible berries that replace the flower clusters and ripen to a purplish black color. Leaves: The leaves of this plant are relatively small, thin, round to oval in shape and have a toothed edge mostly on their top half. Leaves are alternate and deciduous. Overall size: Ranges from 1 to 5 meters in height. Other notes: Its berries were popular with Native groups throughout the Pacific Northwest region. These forest plants provide winter browse for ungulates such as moose, deer and elk. The stems were turned into arrows, digging sticks, drying racks and other implements. General: This is one of the more well known plants of coniferous forests. It is a classic thicket forming shrub that forms a distinctive part of many forests in the Pacific Northwest. Flowers: Small, whitish-pink, shaped like urns. Grow in lines of between 5 and 15. The stalks of each flower bend so that they all hang down in the same manner. Fruits: Reddish-blue to purple-black rounded edible berries, in lines like the flowers before them. Leaves: Leathery, thick, oval to egg shaped, alternate, evergreen 5-10 cm long, edges finely toothed. Overall size: Ranges from 20 cm to several meters in height. Other notes: These forest plants provide food for many forest mammals from bears to mice, also eaten by birds and insects. In many places, salal was the most abundant and important food source of many Native tribes. Leaves can be chewed as a hunger suppressant. General: Most people are familiar with hazelnuts. Though, many don't know that a wild variety grows among the coniferous forest plants in the Pacific Northwest. It is rather short and shrubby, so most people might not recognize it as a nut-bearing tree. Flowers: Male and female flowers separate. Males in long catkins that appear in the fall and flower before the appearance of leaves. Female catkins tiny, with long, pinkish-red stigmas. Fruits: The fruits are spherical nuts, just as edible as the store bought variety. Though on average they are a little bit smaller. Leaves: Alternate leaves that are elliptical or oval, with a heart-shaped base and a pointed tip. Edges are doubly toothed and the leaf is paler below, fuzzy to the touch. Overall size: grows between 1 to up to 4 meters. Other notes: One of the favorite foods of local squirrels. Were picked early by Natives of many tribes and then stored to allow to fully ripen. Long, flexible shoots were sometimes twisted into rope. General: A truly beautiful addition to the coniferous forest plants of the Pacific Northwest. Flowers: Richly pink, 5 petaled, between 4 and 8 cm across. Fruits: Brick red to purplish-red, round hips. Generally 1-2 cm across. Hips are edible if seeds are removed. Leaves: Pinnately compound, with 5 to 7 leaflets. Each leaflet elliptic, toothed edges and rounded tips. Overall size: grows up to 3 meters tall. Other notes: Flowers attract a wealth of flying insects. Hips provide winter food for birds and small mammals. Leaf tea was used by some Native tribes for eyewash for cataracts or to enhance eyesight. The leaf poultice was used for sore eyes or applied to bee stings. 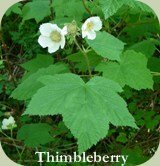 General: A common, thicket forming member of the blackberry genus. This is one of the more common coniferous forest plants, often showing up in open areas along trails and forest edges. Flowers: The flowers are 5-petaled, white and crinkled, up to about 4 cm across. Fruits: A dome-shaped, raspberry-like fruit. Edible. Taste varies from site to site. Leaves: Large, 5 pointed, maple-like leaves that are alternate and deciduous. Overall size: between 1 and 2 meters tall. Other notes: Fruits eaten by many birds. Many Native groups collected berries and spring shoots for food. The leaves have several utilitarian uses including emergency toilet-paper and they can also be turned into quick berry baskets. There are many other amazing and useful coniferous forest plants in the Pacific Northwest. Get to know them today!